Yes, the time gets away from us, right? At least I finished it before their first anniversary!!! Thanks for the sweet words Sandra. What a great quilt. I too really love the relief quilting and would like to try it some time – it’s a fabulous detail. Glad you liked it!! Thanks a bunch. 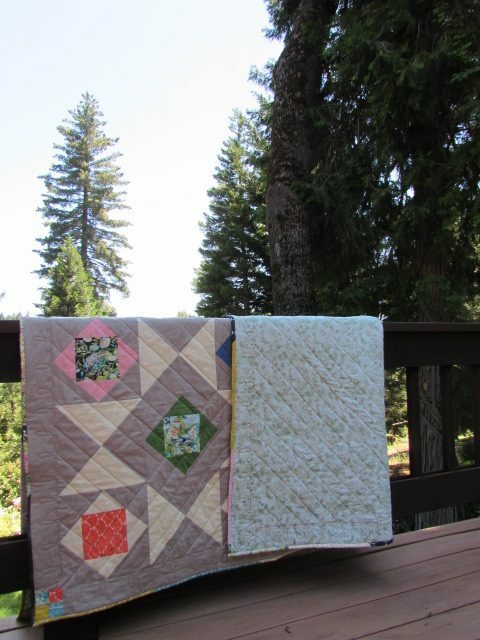 I have a tutorial for relief quilting if that might be of help. Let me know if you need any help or have questions. Beautiful finish and what an amazing way to finish the bottom border with relief quilting. That is such a cool idea! I am sure they will treasure your gift. Isn’t that photo amazing? 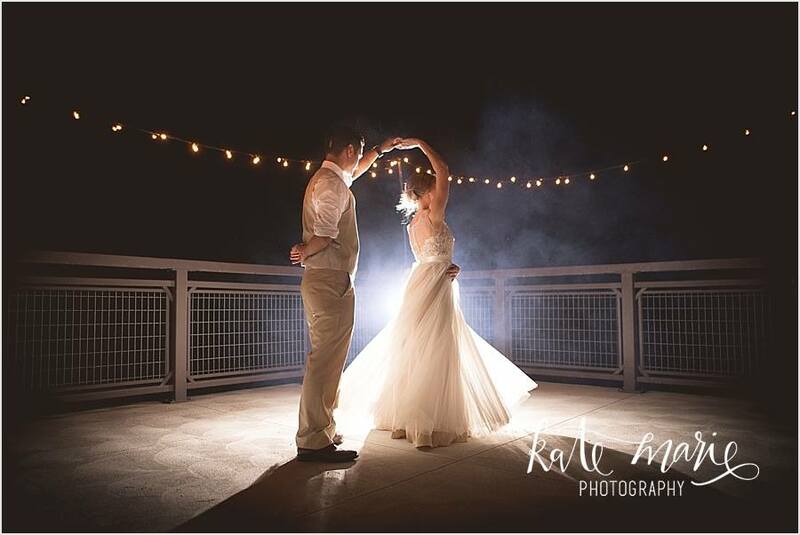 Their photographer really did a wonderful job with their wedding pictures and this is definitely my favorite!! Yes, a beautiful quilt Bernie! I’m sure the newly weds will cherish it. Thanks Val. I hope so. What a lovely quilt for your nephew. I’m sure they’ll love it! The relief quilting of their name and date is a great idea. Love the scrappy binding, too. And what a great picture with those trees. They’re gigantic! Surely that’s not your yard? That’s a real beauty shot! Hey Mari, We do have one redwood just about this size in our yard but these two happen to be on the grounds at our fairgrounds. Julia and I spotted it and thought it a good place for a photo. So gigantic, right? Janine, I would be honored if you copied. I thought for a while I would write up a tutorial but really, that is not my forte. Even when I bought the solid fabric for the borders and blocks I guesstimated and ended up with way too much. 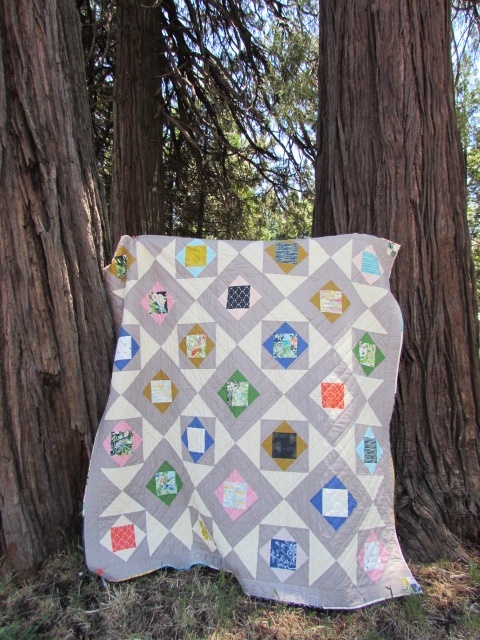 Not a big deal because I love both of those solids but quilty math isn’t a strength of mine!! Thanks so much for the feedback on the quilt. I am very pleased with it. Yes, to the redwoods. Aren’t they spectacular? We have one in our yard that I just love. These two are on the grounds at our fairgrounds. Julia and I spotted them and thought it would be a fun place for a quilt-in-the-wild sort of picture. Love the finished product, I am sure to see it on their guest bed when we go to visit for the rodeo in July. Who wouldn’t love this beautiful quilt? Thank you Karen!! I sure hope they will enjoy it for a long time to come. Relief quilting is so much fun and truly not difficult. I think it gives a great effect. If you go to the top of my page and look at the tutorials tab, you will find a post on how to do this. I am happy to help if you need it!! 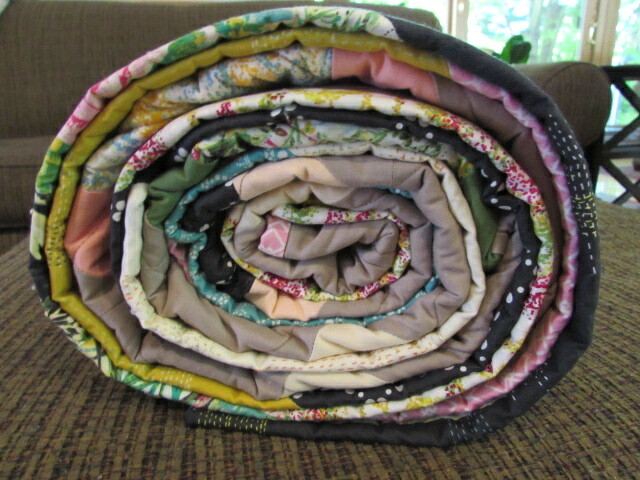 Isn’t it the best when a quilt you give someone is truly loved and used? Even if it gets grubby. 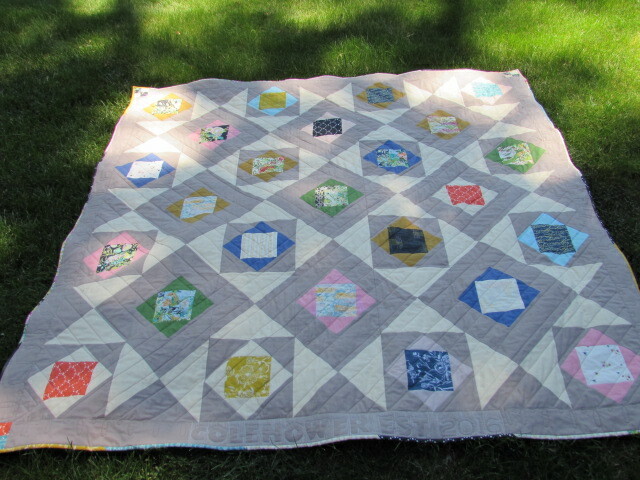 It makes me happy when the new owner really treasures and uses the quilt. Great quilt, I love love the design you quilting on the border. Thank you Cheryl. 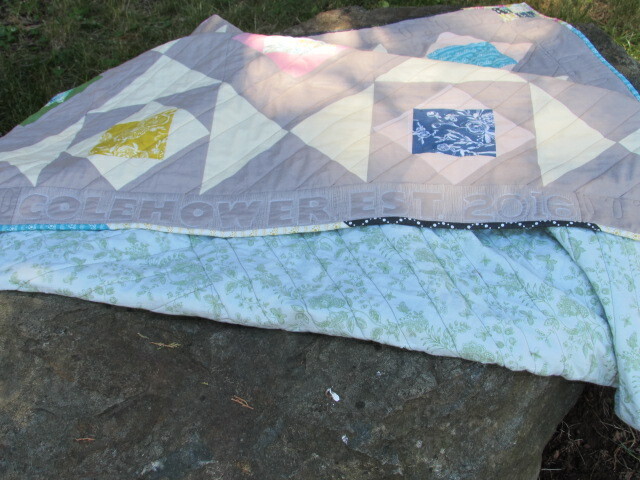 I am so happy to have finished this quilt after setting it aside many times. It is on the way to its new home!! Just beautiful. I love the soft grays and off-white with those little bits of color. 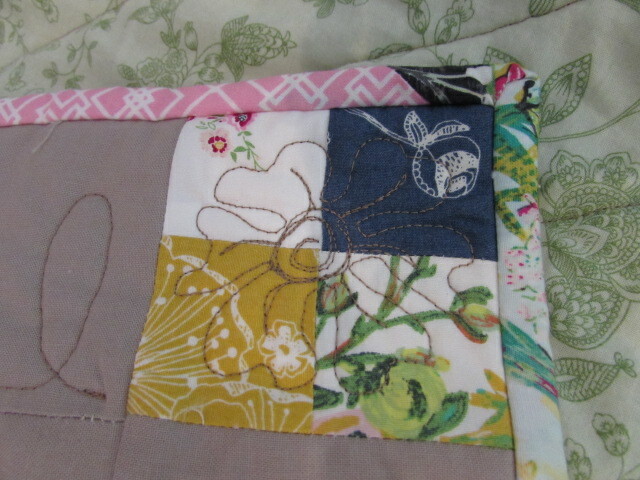 And of course, the lovely relief quilting makes it ultra-personal. Fabulous finish! Oh Bernie this is a wonderful gift and I can only imagine how much they will love snuggling under it! 🙂 Beautiful!! I don’t know how I missed this post! It turned out beautifully, and I love the outline stitching. I know they will cherish this quilt Bernie!